What fantasy world do you wish you could visit? Our May A WHOLE NEW WORLD box will transport you across several of our favorite fantasy worlds—and it will leave you with a serious case of wanderlust! Fandoms include: Harry Potter, The Chronicles of Narnia, Strange the Dreamer, Ready Player One and A Darker Shade of Magic. For the first time in Shelflove history, we are including two new release hardcover exclusive edition books! Both our full box subscribers and book only subscribers will receive We Hunt the Flame by Hafsah Faizal. This book will feature an alternative cover on the reverse of the dust jacket which was first seen on the Advanced Reader Copy editions. Our full box subscribers will also receive Romaov by Nadine Brandes. This be our second ever exclusive cover featuring a dramatic color change, as well as foiling and other special changes that will not appear on the original edition. If you are a book only subscriber, this month and would like to also receive Romanov as well, we are offering a one time add-on option. We are also thrilled to announce that we have collaborated with Blanca Design (formerly Miss Phi) to create an exclusive Harry Potter inspired design (not the one shown here). Check our instagram for more vendor reveals in May! What fantasy world do you wish you could visit? 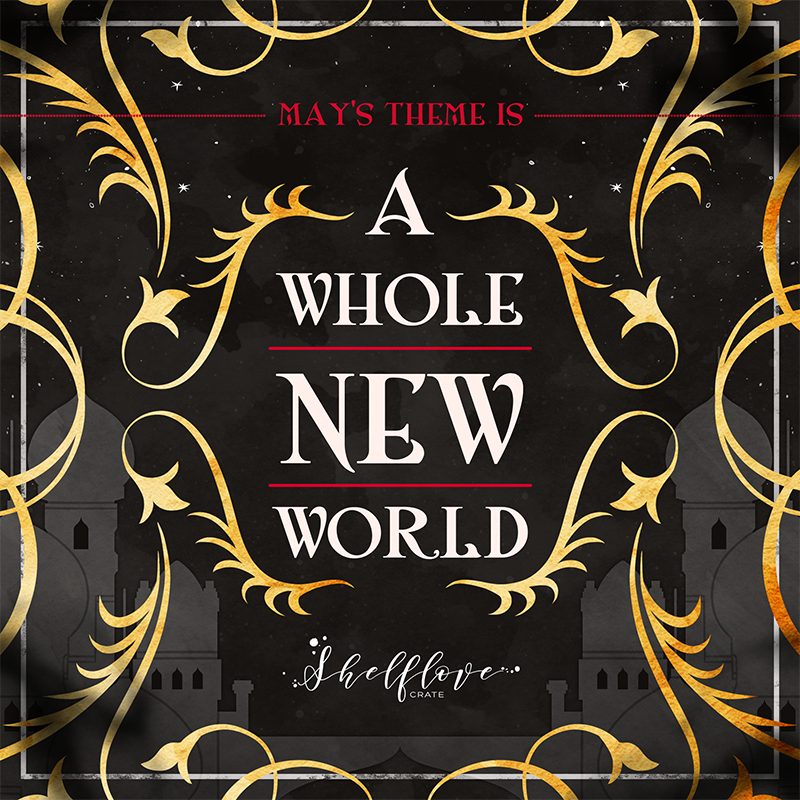 Our May A WHOLE NEW WORLD box will transport you across several of our favorite fantasy worlds—and it will leave you with a serious case of wanderlust! -Fandoms include: Harry Potter, The Chronicles of Narnia, Strange the Dreamer, Ready Player One and A Darker Shade of Magic. -For the first time in Shelflove history, we are including two new release hardcover exclusive edition books! Both our full box subscribers and book only subscribers will receive We Hunt the Flame by Hafsah Faizal. This book will feature an alternative cover on the reverse of the dust jacket which was first seen on the Advanced Reader Copy editions. -Our full box subscribers will also receive Romanov by Nadine Brandes. This will be our second ever exclusive cover featuring a dramatic color change, as well as foiling and other special changes that will not appear on the original edition.